grandma's cookie jar: Love Is . . . Free Printable! With Valentine's Day just around the corner, our thoughts turn to, "love", but what is, "love"? What does "love" really look like? Is it about all the "mushy" hugs and kisses, or is it something more? When I think about, "love", I think about commitment. It is a choice. A decision. A commitment. While there are many "definitions" for, "love", the one which covers all the bases for me is found in I Corinthians 13 . . .
"What if I could speak all languages of humans and of angels? If I did not love others, I would be nothing more than a noisy gong or a clanging cymbal. What if I could prophesy and understand all secrets and all knowledge? And what if I had faith that moved mountains? I would be nothing, unless I loved others. What if I gave away all that I owned and let myself be burned alive? I would gain nothing, unless I loved others. Love is kind and patient, never jealous, boastful, proud, or rude. Love isn’t selfish or quick tempered. It doesn’t keep a record of wrongs that others do. Love rejoices in the truth, but not in evil. Love is always supportive, loyal, hopeful, and trusting. Love never fails! Everyone who prophesies will stop, and unknown languages will no longer be spoken. All that we know will be forgotten. We don’t know everything, and our prophecies are not complete. But what is perfect will someday appear, and what isn’t perfect will then disappear. When we were children, we thought and reasoned as children do. But when we grew up, we quit our childish ways. Now all we can see of God is like a cloudy picture in a mirror. Later we will see him face to face. We don’t know everything, but then we will, just as God completely understands us. For now there are faith, hope, and love. But of these three, the greatest is love." I want my grandsons to know this "definition" of love. I want them to see it in everything I say and do, so as we talk about Valentine's Day and make fun crafts, we will also be talking about how it doesn't matter how many great things we know and can do, if we do not show real love to others. We will focus on how love is kind, patient, not jealous, boastful, proud, selfish, quick-tempered or keeps a record of how others hurt us. We will focus on how love is loyal, hopeful and trusting and never fails! I want Josiah, Caleb and Shane to grow up to be people who love others with this love! 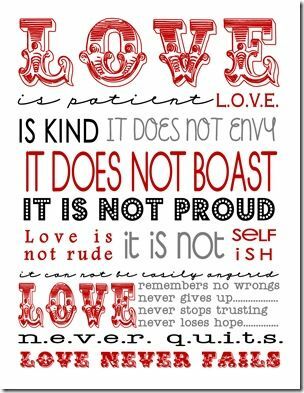 I was browsing on Pinterest and found a lovely, free printable of I Corinthians 13 which I'm very happy to let you know about. You'll find it at this link! Enjoy!